The Lao Peoples Democratic Republic (Lao PDR) is one of the world’s poorest and least developed countries but is comparatively forest-rich nation. Therefore forest management and utilisation is an important part of the government’s development policies and a vital source of wealth in the asset poor nation. Since 1990, it is estimated that the area of forest in Laos has decreased by an average annual rate of 1.4 per cent, or 134,000 hectares. Laos is one of the few remaining SE-Asian countries to allow harvesting of native forests and is under increasing international pressure to restrict native forest utilisation and postpone further plantation development until effective sustainable forest management, monitoring and compliance mechanisms are established. To address some of these issues, the Australia-Laos Forestry Capacity Building and Training project was held in Australia in late 2011 as an initiative of the Institute of Foresters of Australia (IFA), which funded the exchange in collaboration with ACIAR and the Crawford Fund. Several government representatives from Laos attended the training, which involved presentations, lectures, field trips and hands-on exercises over a three-week period. 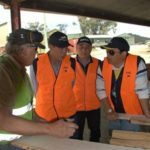 The course was supported by a number of forestry and government organisations in Australia, with experts from these organisations able to share their knowledge and expertise with attendees. “Objectives were achieved by providing the participants with opportunities to take part in field-based supply and value-chain operations in Tasmania and Queensland. Presentations by visiting and practising experts provided strategic training in forest management and policy development,” said Mr Aidan Flanagan, General Manager of the Forests and Forest Industry Council of Tasmania, and the Chairman of the IFA Tasmania Division.